American Offshore Energy takes a page out of America's Cup sailboat design technology to build a patented high-tech, low cost floating Vertical Axis Wind Turbine (VAWT). The aerodynamic section of this VAWT is built with a combination of sailboat mast and bicycle wheel technology. The tension and compression design principles allow for stiff, light weight fixed-wing-composite sail structures that can be scaled to huge sizes. 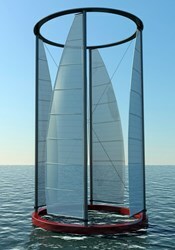 The low center of gravity and broad support base creates a stable floating wind turbine design. With kinematic support bearings and generation at the perimeter, there is no central shaft. Each bearing point is directly above one of three floats which are tied together structurally and secured to three anchor screws on the sea floor and located to provide anti-rotation. The turbine would be assembled on shore and could be towed though shallow water out to deep water moorings. 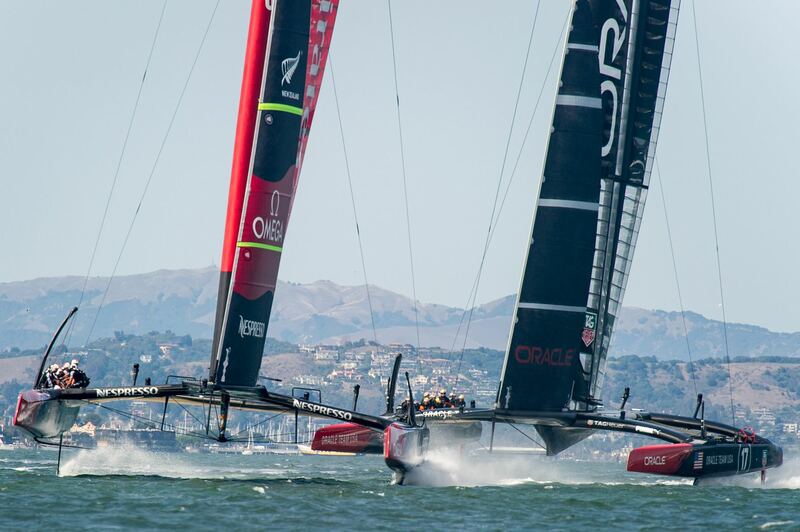 Sail-type air foils are the lowest cost per sq. ft. and the lightest weight air foils possible. They can be automatically reefed to fit conditions or completely furled for hurricanes. A turbine 100 miles off shore could be towed back for major repairs in a day. This reduction in risk reduces the cost of money and insurance on the project. Floating turbines allow for sitting wind farms more than 25 miles off shore, putting them out of migratory bird patterns, NIMBY (Not In My Back Yard) issues and State Jurisdictions. The daytime thermal issues that require high towers on land are eliminated far out at sea as wind aloft reattaches to the water surface providing high capacity generation factors. Capital costs for the large castings, gears and roller bearings in the conventional turbine supply chain are not necessary with this design. Manufacturing can scale quickly using common steel fabrication and fiberglass technologies. A franchise model could put wind turbine factories and jobs in our old ship building, Navy Yards or cargo transfer ports on both coasts and the Great Lakes allowing us to leapfrog foreign turbine builders with a technology that suits America’s resources. For more information about this technology, contact Erin Lievens at 610-494-3700. Or, visit http://www.AmericanOffshoreEnergy.com.